Numerous plumes are seen rising from long tiger-stripe canyons across Enceladus' craggy surface. Continued study of the ice plumes may yield further clues as to whether underground oceans, candidates for containing life, exist on this distant ice world. 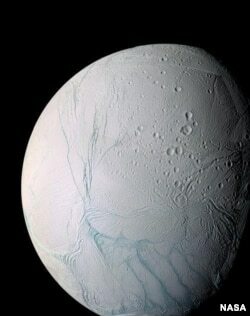 A “global” ocean of water, thought to be a key ingredient for life, sloshes around under the icy crust of Saturn’s moon, Enceladus, according to NASA. Evidence of this has been spotted by the Cassini spacecraft in the form of geyser-like sprays of water vapor coming from the south pole area. Using seven years of imagery collected by Cassini, scientists found the moon has a slight wobble as it moves around Saturn. "If the surface and core were rigidly connected, the core would provide so much dead weight the wobble would be far smaller than we observe it to be," said Matthew Tiscareno, a Cassini participating scientist at the SETI Institute in Mountain View, California, and a co-author of the paper. "This proves that there must be a global layer of liquid separating the surface from the core," he said in a statement. Scientists still don’t know why Enceladus’ ocean isn’t frozen, but they think it might be because of heat generating tidal forces exerted by Saturn’s massive gravity as the moon orbits the gas giant. This October, Cassini is scheduled to approach the moon for a near flyby, coming as close as 49 kilometers from the surface. Scientists believe several moons in the solar system may hide water beneath their surfaces, but Enceladus has been shown to also have geological activity such as hydrothermal vents, which are thought to be necessary for life. The research is presented in a paper published online this week in the journal Icarus.